Blue Painters Tape is a multi-use tape featuring a specially formulated, medium tack adhesive. This works for textured and semi-rough surfaces which gives the tape the tackiness it needs to adhere to your surface but still allows for clean removal for up to 21 days. If not overheated, your surface will be damage free and clear of residue. Blue masking tape is also UV resistant, so it can be used for both indoor and outdoor applications. REMOVE ASAP! The adhesive in painters tape is known as semi-permanent removable. If you leave it on for over a month then you will have great difficulty removing it. It will tear and leave residue behind. 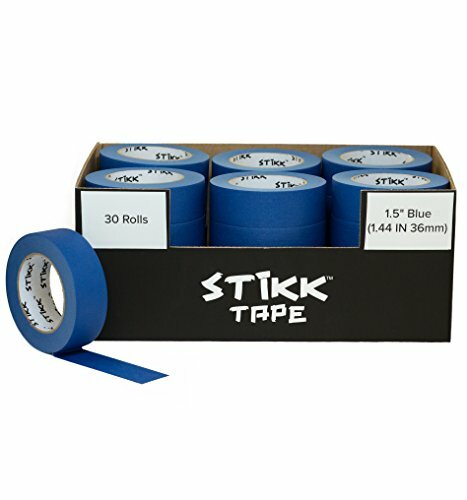 If you have any questions about this product by STIKK TAPE, contact us by completing and submitting the form below. If you are looking for a specif part number, please include it with your message.